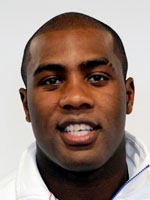 When the giant Frenchman Teddy Riner went into the 2011 judo world championships his hometown fans in Paris unfurled a banner reading 'Teddy Winner', and win was just what he did, claiming a fifth world title at the age of 22. Judo is hugely popular in France and 1996 and 2000 Olympic champion David Douillet is something of a national hero with four world titles of his own, but the former heavyweight stated clearly that he believed Riner to be far superior to himself. Quite a compliment. "He was close to perfection," Douillet said when Riner took the 2007 title in Rio. "When I see Teddy, I see an outright extra-terrestrial!" The respected Japanese Olympic heavyweight champion from 1984 Yasuhiro Yamashita is also convinced of Riner's astronomical potential. "Teddy will be Olympic champion in London. Technically and physically he's the best," said Yamashita, a four-time world champion himself. Since he burst onto the scene in 2007, he has added five further major gold medals to his growing hoard; one European 100kg plus title, and four further world titles, the 100kg plus in 2009, 2010 and 2011 and the open category title in 2008. In fact the Guadeloupe native has only missed out twice on the big stage; finishing third after some highly disputed calls at the 2008 Olympic Games in the 100kg plus category and finishing second at the 2010 worlds in the open competition. He was born April 7, 1989 at Pointe-a-Pitre, Guadeloupe the youngest of four children and was pushed toward sport from the earliest age to channel his prodigious energies in the right direction. He now measures 2.02m and weighs 128kg. But far from looking cumbersome Riner moves more like a middleweight boxer dancing around on his toes. Riner jokes today that everyone beat him up easy when he first took up judo, but it looks as though it'll be an extremely long time before this ever happens again. He is also in possession of an aggressive but enthusiastic nature with a deep-rooted will to win. "I want it, I love to win," he says. Judo is the search for Ippon ( the ultimate sweeping move), and you can allow your opponent no quarter." He would appear then to have all the ingredients necessary for victory at London 2012 for the man already earning a million euros a year. Riner says his judo days will be followed by a career in business and is studying at the prestigious Sciences Po university in Paris. First however he needs to invest in gold, Olympic gold.